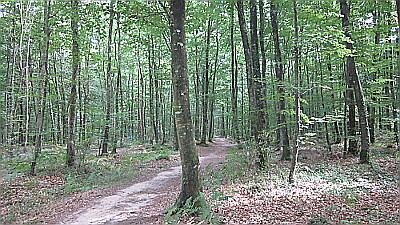 This beautiful predominantly beech forest on the eastern edge of Brittany has many well-marked options for walkers. The surfaced forest tracks (not normally open to traffic) are long, straight routes radiating out from the various crossroad points which have parking and picnic tables. Other winding paths through the trees crisscross the tracks and provide circuits of about 1h30mins. The main road D177 (direction Landéan, Louvigné-du-Désert) runs right through the middle of the forest and passes the Carrefour de Chedenet, a good enough place to start as any. Off to one side here is the leisure lake with a beach, kayaks and a walking trail. 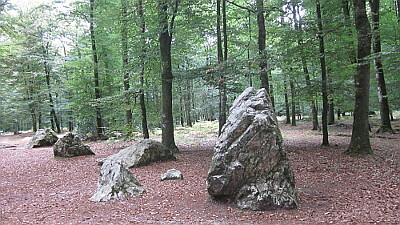 A short distance away on the other is the famous Cordon des Druides stone alignment. From the crossroads you can also take the route to the Pierre de Trésor (megalith), a site on the very attractive Circuit de Longue Noë (6.3kms). Circuits are easy to follow with colour-coded waymarking on trees at very regular intervals and clearly signed points of interest. There are many of the latter: megaliths, underground cellars, salt-smugglers paths and a Gallo-Roman camp. This Oppidum de Poulailler, naturally situated on the highest point, can be seen just off the GR which passes through the forest (red and white waymarks) and also touches the Carrefour de Chedenet. It also passes the megalith of the Pierre Courcoulée (which has its own 4.7km circuit). The circuit of the Vieux Chateaux (5.4kms) includes the Cordon des Druides mentioned above and takes a long loop to return via the lake below the hamlet of St-François where there was once an ancient monastery. The forest provides any number of strolls without the need for following a particular route. From the Carrefour de Chedenet to the Carrefour des Serfilières and back on the same route (technically the path is part of the Circuit de Pierre Enfouie) will offer a very pleasant hour’s walk. No wooded walk lover will be disappointed by this fabulous forest.